This step by step article is about how to build a bird feeder. If you want to freshen up the look of your garden or you just want to attract the singing birds to your property, building a basic wooden feeder is a must-have diy project. There are many shapes and designs to choose from, so we recommend you to study the alternatives before taking a decision. A basic wooden bird feeder can be built in just a few hours, if you have all the materials and tools. It is essential to smooth all the cut edges, if you want to obtain a professional result. Therefore, use a sand block and 120-grit sandpaper, to smooth the cut edges, along the wood grain. Alternatively, you could round the edges with a router and a 1/4” drill bit. Work with great care and attention, otherwise the birds may injure in the sharp edges. Moreover, cut out the round entrances with a hole saw drill bit, or using a jig saw. Align all the components, drill pilot holes and insert the nails to lock them together tightly. Apply wood glue to the edges of the components, as to enhance the bond of the joints. Fill the holes with a good wood filer and sand the wood surfaces, after the compound has dried out. You could also paint the exterior faces of the birdhouse in a mild color, as a loud color would keep away the birds. First of all, you need to use the right plans for your needs. After deciding the shape and the size of the bird feeder, you can continue the project and buy all the materials. 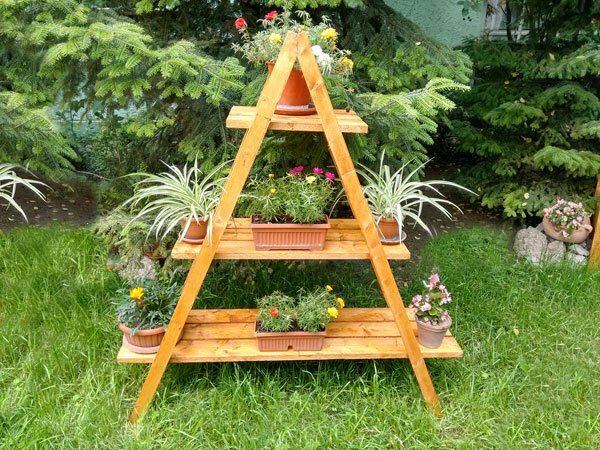 Smart tip: As you can see in the image, in this article we show you how to build a simple bird feeder, out of 1×8 wooden boards. Alternatively, if you want to scale down the feeder, you could buy 1×6 boards. In order to obtain a professional result, we recommend you to check the wooden boards before buying them. Therefore, the boards should be in a good condition and perfectly straight. Choose quality lumber, as you will place the feeder outdoor. Pine, cedar or redwood are excellent choices as you can work easily with the boards and they are highly durable. You will also need a small piece of plexiglas, to build the side walls, two small hinges, two eye screws and 1 1/4” galvanized screws. If you buy all the materials, they shouldn’t cost you more than 5 dollars. After buying all the materials and getting the tools ready, you can start the actual construction of the bird feeders. Begin with marking the cut lines on the wooden boards, as in the image. Use a pencil to draw the cut lines. Smart tip: We highly recommend you to use a carpentry square, otherwise the corners won’t be right angled. Double check all the measurements before making the cuts, if you want to obtain a professional result. After marking all the cut lines on the boards, you should perform the actual cuts, using a circular saw. In order to get perfectly straight nice cuts, we strongly recommend you to place the boards on a horse saw and to lock it into place with several C-clamps. Afterwards, clamp a straight fence into place, to guide you when making the cuts. Make sure the blade of the circular saw will go exactly over the lines, at both ends. You can read more about cutting straight lines here. After making the cuts, you have to continue the projects by making the round entrance. Use a hole saw drill bit to obtain accurate results and to get the job done quickly. In most of the cases, the hole should have about 1 1/4” – 1 1/2” in diameter. Alternatively, you could also cut the round holes using a jigsaw. Drill a large starting hole inside the circle, just along the cut lines, and make the cuts with a jig saw. Smart tip: Don’t forget to sand the cut edges, with 120-grit sandpaper, to make them smooth. Next, cut small channels (1/4” deep) along the sides of the front and back faces, about 1/2” from the edges. In order to get the job done accurately, you should use a table saw. Nevertheless, you can also cut the grooves in the wood, using a sharp hand saw. Smart tip: Afterwards, we used a carving tool to make the grooves deeper and wide enough to fit the plexiglas side panels. Smooth the edges with fine sandpaper. Next, attach the front and back faces to the flooring and secure them into place with 1 1/4” finish nails. As you can see in the image, you need to align the components properly, before drilling the pilot holes in the base of the feeder. Mark a line to the base of the bird feeder, about 1/4” from the edges. Afterwards, drill pilot holes using a drill machinery and a small drill bit. Drive in about 4 screws at each end of the box, making sure you place the components on a wood block, otherwise you might damage the support surface. The frame of the birdhouse, after attaching the front and back faces. You could also add wood glue to the enhance the bond of the joints. Continue the project by building the sides of the bird feeder. In order to add character to the construction, we recommend you to make the walls from 1/8” plexiglass. In order to get accurate results, we recommend you to mark the cut lines on the plexiglass sheet, before performing the cut. Use a good hack saw to make the side walls, along the cut lines. Don’t forget to sand the cut edges of the plexiglass pieces, as to make them smooth. Afterwards, slide the side walls into place, making sure you don’t apply too much force. If the plexiglass panels don’t fit easily into place, smooth the edges with sandpaper. Next, assembling the roof of the birdhouse. As you can see in the image, you should first attach the small piece to the other side of the roof. If you follow our plans, these components should be perpendicular. In this manner, you can secure the roof to the bird feeder easily. Align the components at both ends, before inserting the 1 1/4” finish nails into place. Drill pilot holes before inserting the nails, otherwise the wood might split. Don’t apply too much force when installing the nails, as you might damage the wood. Secure the roof to the gable ends, every 2”, using 1 1/4” nails. Drill pilot holes and insert the screws, to lock the roof into place. Make sure you center the roof, leaving about 1” on both sides. Smart tip: Before driving in the screws, we recommend you to clamp the front face to the back end, otherwise the side walls might slip from position. Attach the hinges to the lid with small screws, before attaching it to the rest of the roof. Make sure the lid opens properly, before driving in the screws. Work with great care and attention, if you want to get a professional result. Smart tip: The small piece will open to fill the box with bird feed. In addition, you can slide out the plexiglass wall anytime you want to clean the bird feeder thoroughly. Make sure you use galvanized screws and nails, otherwise they will rust on the long run. 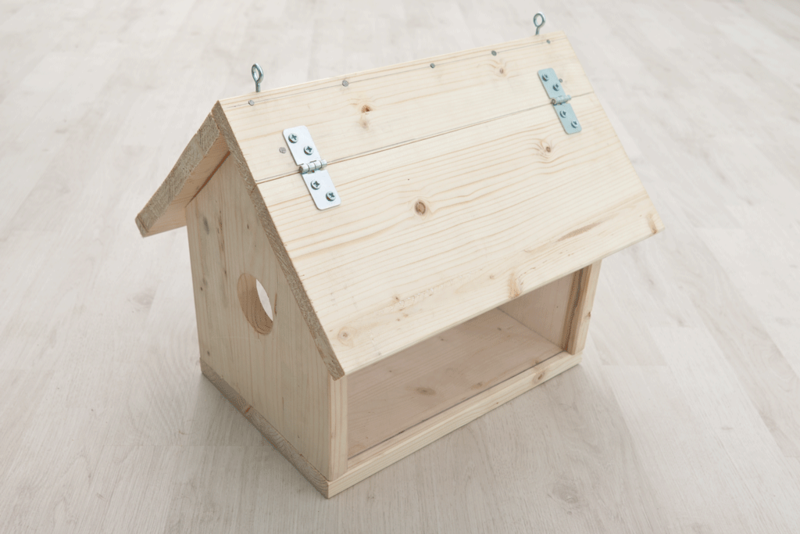 In order to hang the wooden birdhouse to a tree, you should install two eye screws to the roof, one at the front and one at the back of the construction. Smart tip: Pre-drill the several holes in the top ridge, before installing the eye screws, otherwise the wood would split. Last but not least, take care of the finishing touches. Therefore, you should make sure the head of the screws are inserted properly, otherwise they might injure the birds. Fill the holes with wood filler and let it dry out for several hours. Smart tip: Sand the edges and the wooden surface with 120-grit sandpaper, along the wood grain. Clean to residues with a clean cloth, before applying several coats of paint to the exterior faces of the bird feeder. Choose mild colors, otherwise the birds might not come in the feeder. Thank you for reading our article about how to build a bird feeder and we recommend you to check out the rest of our projects. Don’t forget to share our project with your friends, using the social media widgets, if you’ve found it useful. I would like to feature you project on the site, if you want to send a few pics.